The Bost Family: Serving a family. The original title to this was, "Serving your friend who is walking through hell.." or "Serving your friend in need". The point of this post is to shine a light on what is useful and what is not useful when you are serving someone who has been given a new diagnosis, like cancer. I think these suggestions could apply to anyone in need: new baby, colicky baby, broken leg, herpes, stomach flu, bad day, etc and so on. 1. We are in this.. In the hospital, my friends visited and prayed over me and all that we were experiencing. I'll never forget what one friend said, "Mary, we are in this with you. We are here for the long run. You will not walk this alone." That was a blessing. Sometimes when things get hard people tag out. They already have their own circus and they don't need to take on yours. My people didn't tag out. They have walked this journey every step of the way. 2. 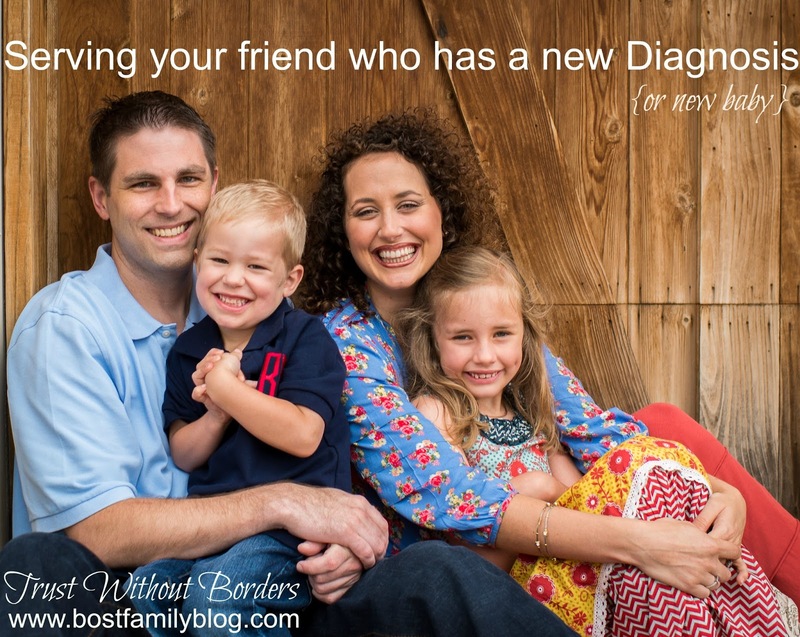 Don't talk about diagnosis unless it is brought up. 3. Let them know you are thinking about them. I loved receiving cards, packages, food, and finding little gifts left on my porch. I have friends who send me text randomly- Hey, I'm praying for you. Hey, you are on my heart today. Or a email with a story. I love that I have some faithful card senders, it means the world to me that they are still thinking of this. Our cancer journey isn't brand new but those people show us- Hey, you are still dealing with this, we are still praying, we love you. Meals during treatment were the biggest blessing! I couldn't do another thing and I was having the hardest time caring for all my people. Meals took a load off! Our church still provides meals during chemo week and they are still a blessing! I also get random text saying- Hey, I made two lasagnas. I'm dropping one off by your house... - I like being bossed into food. *Tip*Don't ask me what I want to eat... I don't know. I don't know what my name is today.. I don't want to eat. Food is just something that I eat to survive so that I can take care of my babies. Bring something that your family loves to eat. My friends cleaned the house while we were in the hospital and put away all my laundry. Since then my mom hired a lady to clean the house to take something off my plate. Go do their laundry or put it away. I had a bad day and my friends showed up with dinner and helped me fold and put away all my laundry. I love to laugh and I love when people make me laugh. This is the biggest. Just pray for them. God is bigger than this, hand it over to him in constant prayer. If you aren't going to help them then leave them alone. This may sound mean but people in crisis don't need additional stress or noise added to their life. I actually prayed this... and God answered. Those are my tips on how to serve a family in need. I hope you can apply them to someone in your life.